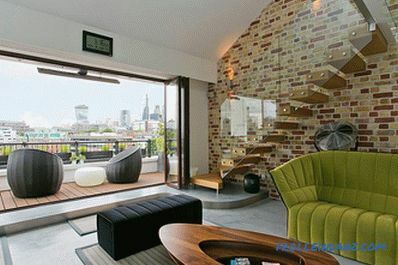 Brick walls and a modern interior are things that would seem absolutely incompatible. But over the past few years, designers have increasingly used beautiful brickwork when they want to enhance textural diversity, make the interior character unique, add a touch of timeless charm. For some, the brick in the interior of the living room is an expression of wealth, a way to emphasize the historical past of the building, the personification of the connection of the past and the present. 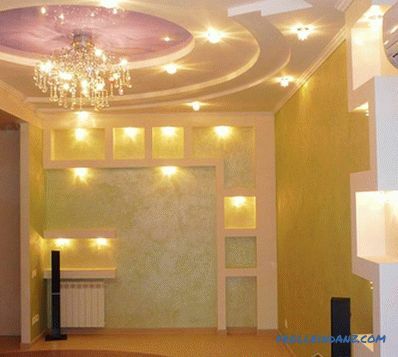 For others, it is an opportunity to add elegance and individuality to a room that would otherwise look a little boring. 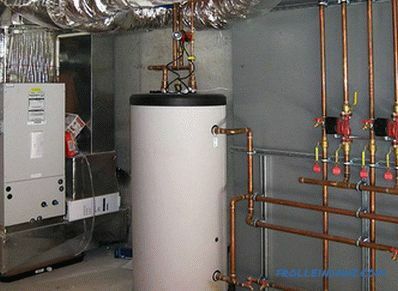 Regardless of what led you to think about the need to diversify the interior of your living room with a brick wall, there is no doubt that here you will find a lot of interesting things for yourself. A brick wall can have a wide range of shapes and shades, which makes it possible to use this element in almost any style - from industrial and chebbi-chic to modern and classic. 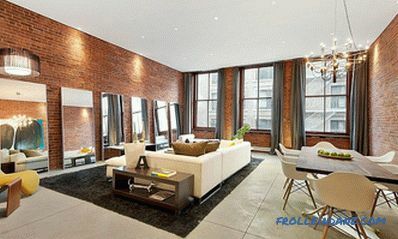 Today we present to your attention a collection of fascinating living rooms with brick walls that fascinate and inspire. Enjoy! 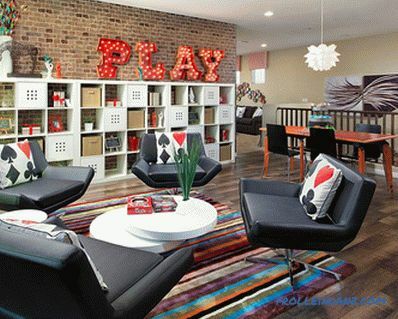 A modern living room with an accent brick wall is currently a hot trend that seems not to lose its popularity . 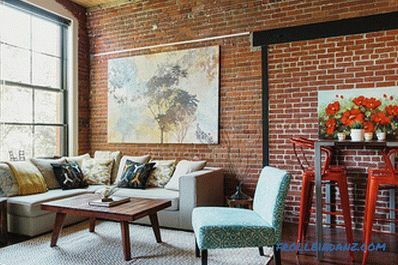 If you are lucky enough to live in an apartment or a private house, where the brick walls are neatly covered with layers of finishing materials, it’s time to dig deeper to expose the brickwork. 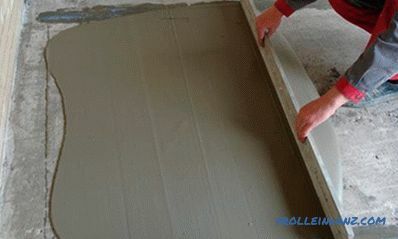 The overall attractiveness of the premises will largely depend on the color and quality of laying bricks. In the event that what you saw during the “excavations” doesn’t please you very much, the safest and most reasonable way out is to paint the bricks in white: this will preserve a neutral background and add texture at the same time. Anyone looking for a more dynamic alternative can try other neutral colors to create a background — gray or even black. 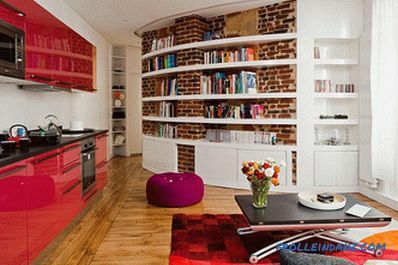 The classic red brick wall also looks appropriate in modern living rooms, if the rest of the interior is neutral and as concise as possible. 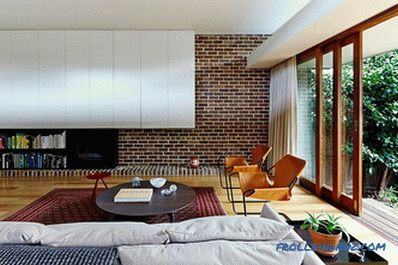 Modern living room: a combination of a brick wall with modern white shelves (from Downie North Architects). Gray brick wall (from Stuart Sampley Architect). A stylish living room in one of the attic apartments of Chicago (from Jessica Lagrange Interiors). 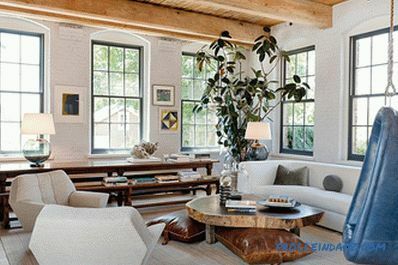 A living room overflowing with natural light (from Steele Street Studios). 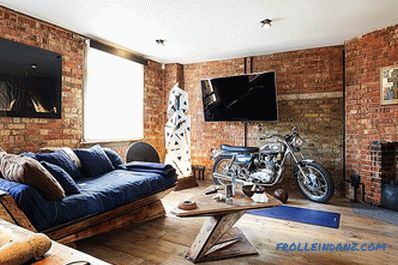 An eclectic living room with a masterful use of a brick wall as an accent (from StruXture Photograph). 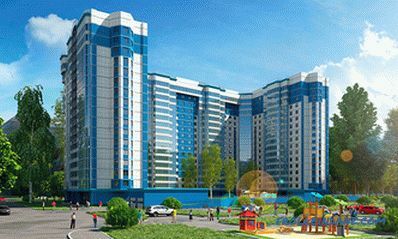 If you are unlucky, and your apartment is located in a boring glass and concrete “box”, then in this case you still have a chance to drastically change the interior of your home. 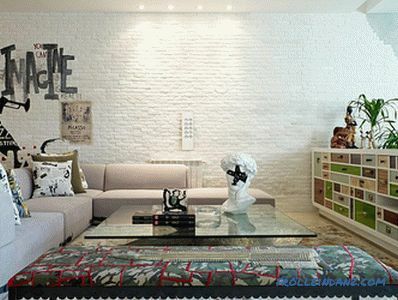 Use for the transformation of the walls in the living room decorative brick. 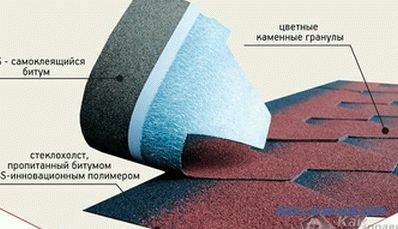 Of course, it can’t be compared with real brickwork, but in these circumstances it can be considered a good alternative. To decorate, so in a big way! 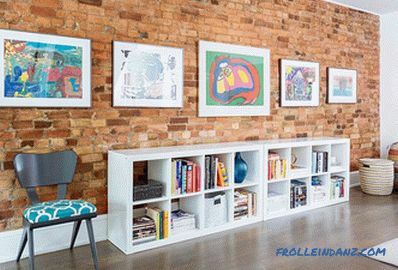 An uncovered brick wall can serve as an excellent bright background to showcase a collection of works of art or especially valuable family photos, because it is much more expressive than a regular white wall. 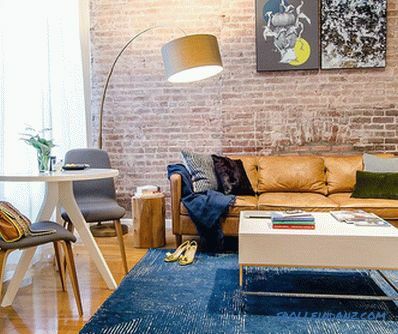 With proper lighting and the selection of decor and accessories, the living room with brick walls can look more attractive as furniture becomes neutral in neutral shades. Making a room with brick walls is not easy, because with improper planning, eclecticism can quickly grow into chaos, a clumsy mess. 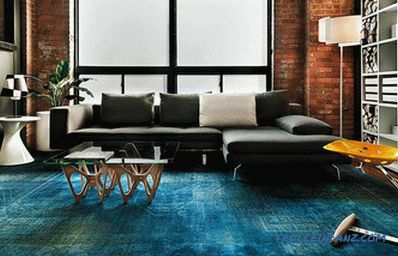 A bright blue sofa, an unusual carpet and luxurious armchairs give the living room a lively feel (from S. K Interiors). A modern living room with a copper-blue rug and a dark gray sofa (by James Maynard-Vantage Imagery). 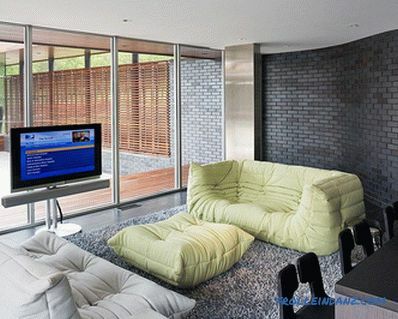 A modern living room with a discreet design (from A Design Lifestyle). 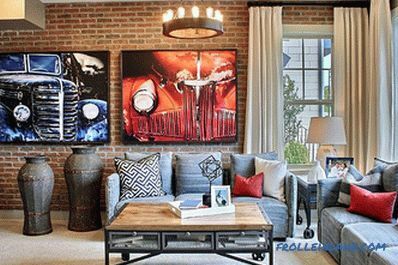 The decoration of the brick wall in the living room with modern painting (from Meghan Carter Design). The main decorations of this living room are a vintage light sign and a magnificent storage shelf (from Meritage Homes). 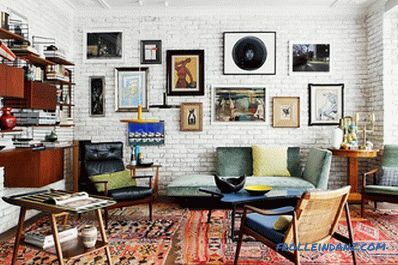 A cheerful eclectic living room with a stunning brick wall background (by Mikel Irastorza). 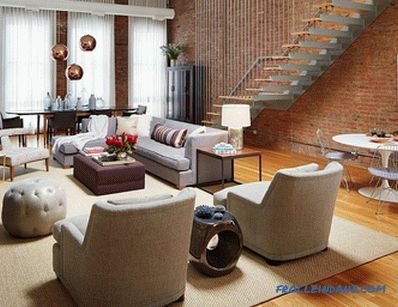 As we mentioned earlier, there are many styles that allow the use of a brick wall in the living room interior. 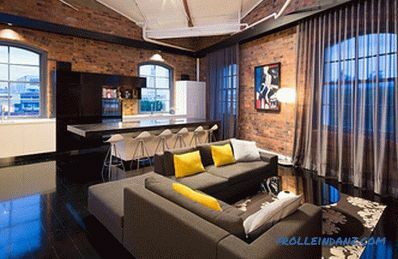 But the sparkling and functional industrial style is without a doubt at the top of this list. 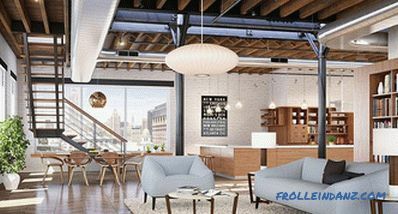 Industrial style and brick walls fit together like nothing else, and as long as adaptive reuse of old structures will be the norm in the repair world, a brick wall will certainly be used here as a decorative element. In combination with exposed duct pipes, large windows with dark metal frames and unusual lighting, the brick creates an ideal living room in terms of the chosen style. Bamboo in a pot against a brick wall (from Luv2Dezin). 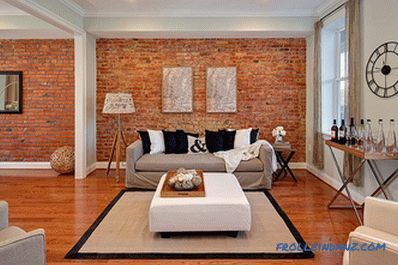 Living and dining room with brick walls (from The Graces - ReMax Hallmark Realty). Natural wood and painted brick walls create a wonderful contrast in this relaxed living room (from Huniford Design Studio). White painted brick walls add to the theatricality of this industrial-style living room located on the attic floor of a Chelsea house (from Studio D + FORM). The white brick wall is the most popular among modern homeowners who want to bring a textural contrast to the room (from Vick Vanlian Architecture and Design). 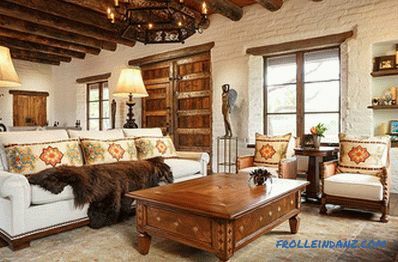 Heavy wooden beams and brick walls underline the south-western style of this room (from Chandler Prewitt Interior Design). 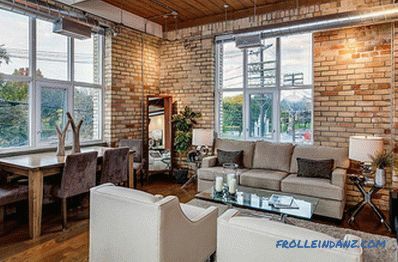 A whitewashed brick wall that enhances natural light creates a cheerful, light and fresh atmosphere in the living room. And in combination with heavy wooden elements, it will serve as an excellent background for a wide variety of styles, for example, for rural or Mediterranean. Do you have a small living room? No problem! 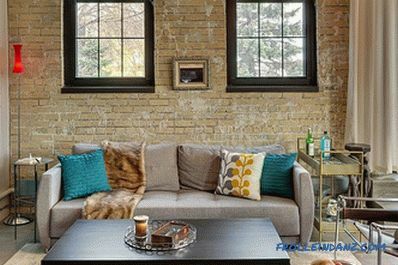 The textural beauty of brick walls brings warmth to a small living space, making it more cozy and welcoming. 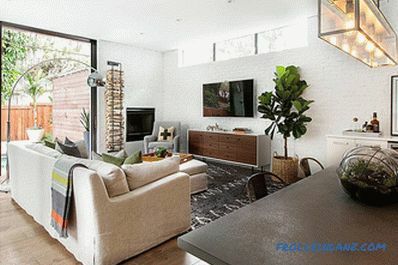 There are two approaches to the design of a small living room with brick walls, and the choice depends on your personal taste and style of the room. 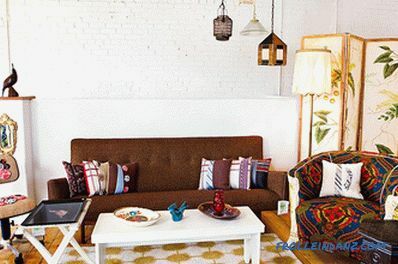 The first is to follow the eclectic path and create chaos, which, by bringing an amazing variety of colors, textures, contrasting styles and unique decor items, will overshadow everything. It requires a balance, only the instinct of an experienced designer can tell when, adding more and more new elements to the interior, you should stop. Black anchors in an eclectic room (from Tiffany Hanken Design). Works of art, a coffee table on wheels and vintage decor add texture to this small room (from M / I Homes). Elegant Scandinavian living room with a female character (from Tara Benet Design). Elegant living room with vintage touches (from Vintage Renewal). Bright and beautiful attic living room in industrial style (from Homepolish). Another approach to the design of a small living room with a brick wall is to draw inspiration in the modern Scandinavian style. Moderation, clear, straight lines and neutral hues are the norm here, and this allows a brick wall to make a bold visual statement. Remember that in small rooms only one style is needed, clearly and distinctly visible, be it modern, industrial, vintage or shebbi chic. 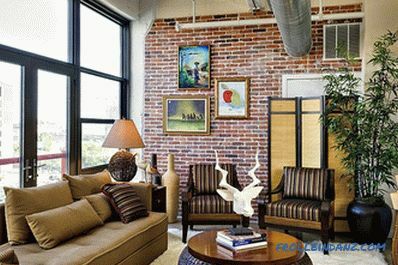 Brick walls provide an opportunity to go beyond the ordinary, and there are many ways to do this without overdoing from a financial point of view. 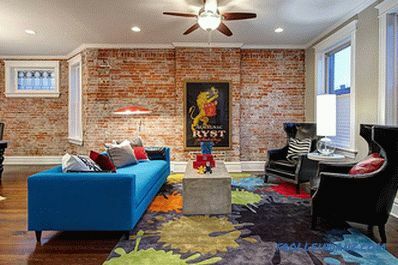 The easiest option is to use graffiti that will add color and pattern to a brick wall and give the room a slightly rough street character. 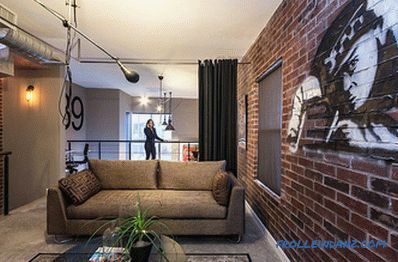 If you are lucky enough to have a curved brick wall in the living room, skillfully highlight this unusual feature - let it become the main attraction. A creative approach made it possible to isolate a curved brick wall in the living room (by Manuel Sequeira Architecte). The curvilinear wall in the modern living room draws attention to itself, overshadowing everything around (from Hufft Projects). 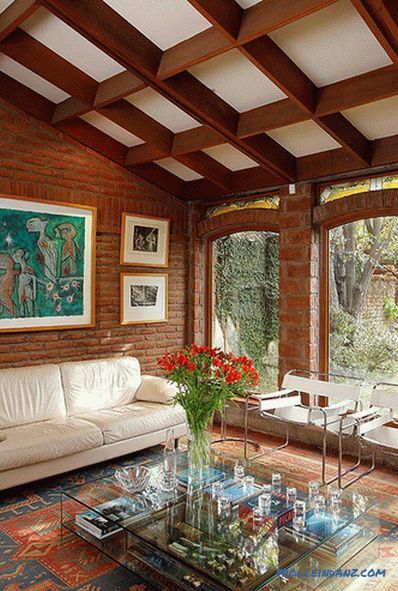 The brickwork gives the modern interior color and texture (from Temza). Graffiti is a great addition to a brick wall (from CityLoft). Light air curtains bring a touch of softness to this magnificent living room (from TONIC Design). The stunning living room of one of the London apartments (from Michaelis Boyd Associates). 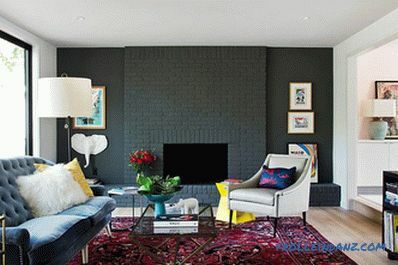 You can also draw attention with the help of a black brick wall, although in some cases the key role will not be played by it, but by the decor around. Play with contrasting textures (for example, light translucent curtains and rough brick walls) or shades (white and red brick walls in one room) to liven up the living room, to make it inimitable. After all, you dreamed about this!